Imagine landing into a vast snow-driven wilderness of Alaska or Greenland. Whiteness everywhere. As your eye meets the horizon, there’s only one word to describe this beauty: snow. It’s the same in Croatia. Moments after you arrive, the intoxicating sweetness of cafe culture washes over you. Life slows down and you click back into the here and now. There’s only one word to describe such zeal: coffee. But let’s not fool ourselves. ‘Snow’ wouldn’t get you far in the Inuit language. There are at least 50 words for snow, describing subtle differences in colour and quality of what only appears as white expanse. Language always reflects what is most important in the lives of its speakers. Snow for the Inuit; coffee for the Croats. The all-embracing Croatian cafe culture is more than loafing around at sun-lit terraces – a familiar image of Zagreb, Split, Zadar or Dubrovnik. This fragrant dark liquid is the lifeblood with which we measure our time, quality of life and soundness of our social ties. Just ‘coffee’ won’t get you far in Croatia. It’s time you learn the whole cosmology. #1 Ajmo na kavu [let’s go for coffee] is the most widespread invitation to socialize. It may sound innocuous, but if you’ve never had coffee with a Croat, you need to branch out from the usual image of chit-chatting over coffee. #2 Croats meet for coffee at various occasions and with different agendas. Sometimes it’s as plain as catching up with friends. There’s nothing sweeter than grabbing coffee after food or clothes shopping, with bags resting by your legs. But the informal cafe setting is also perfect for closing business deals and discussing ‘terms and conditions’ that escape both large and small print. #3 Going for coffee doesn’t stop Croats from exchanging espresso for an alcoholic drink. Even an afternoon session may turn into an inebriated frolic with coffee only as last orders to sober everyone up. #4 Saturday morning coffee rounds fall into a special category. In Zagreb this is called špica and it means being where the action is. Coffee on špica is all about seeing the world and being seen, so heartfelt bonding takes the backseat to strutting around. #5 Dođi na kavu [come round for coffee] is a genuine invitation to visit someone’s home. It’s not mere courtesy like the English equivalent ‘you must come round for dinner’. 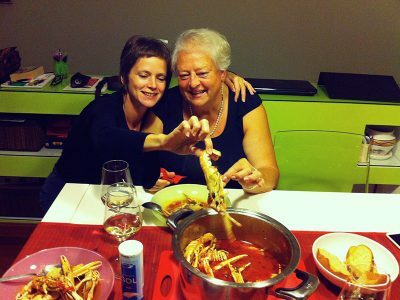 When a Croat invites you to their home, they mean it, so you should follow through. You will most likely be served a delicious homemade cake too. Lucky you! 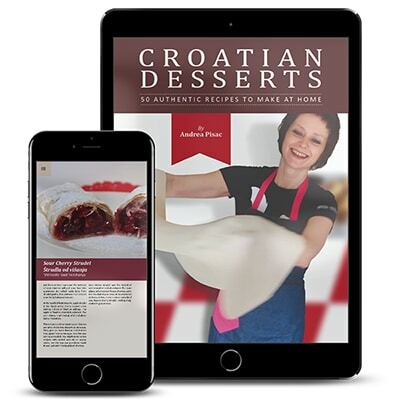 Want to learn how to bake Croatian sweets? Then get your hands on my Cookbook. #6 Close friends announce their impromptu visit with pristavi kavu [put the coffee on], especially when they’re just around the corner. This welcoming cup of coffee is sometimes called kava dočekuša [coffee for greeting guests]. But there’s also kava sikteruša [coffee to get rid of the guests]. We serve you this coffee after a long meal to signal it’s time to pack up and go. #7 While espresso may be the coffee of choice in a cafe, at home, we still like to brew Turkish coffee. Sometimes there is instant coffee on the home menu. But generally we don’t give guests much choice – apart from milk on the side – and as guests we never discuss the quality of coffee we’re served. #8 In fact, we complain only if the coffee is terribly weak and sweet. This one is called kava proseruša [coffee that gives you diarrhea] and will immediately send you to the toilet. No need to tell your host coffee was terrible – they noticed why you left the table. 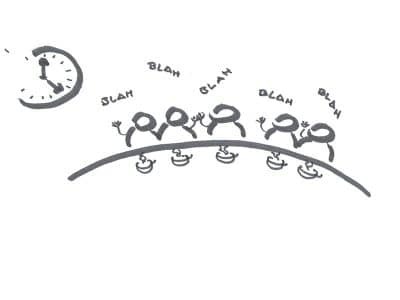 We complain to others as we recount the story. Strangely enough, we’re happy to make proseruša for ourselves every morning to get a healthy start of the day! #9 Coffee makes a perfect gift when you visit someone’s home. For ages, a golden standard has been bringing Franck cigla [a brick] – a brick-shaped 250 grams vacuum-packed coffee of the Franck brand (Croatia’s oldest coffee roaster). While bringing a bottle of wine is a newly acquired act of good manners, showing up with a brick is a foolproof choice. 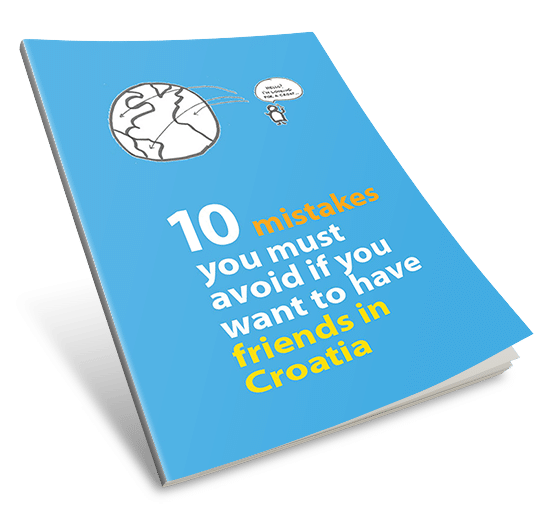 #10 In Croatia, the old saying ‘you scratch my back and I’ll scratch yours’ is often done via coffee. If someone does a favour for you or gives you a gift you can’t repay straight away, you can treat them with coffee. Learn how to say thank you in Croatian. Plaćam kavu [coffee is on me] usually seals the deal and leaves both parties content. The favour could be worth much more than the price of coffee, but ‘coffee on you’ is a way to acknowledge you owe one now. It’s a currency with the highest exchange rate. #11 We never ever go Dutch with coffee. It’s preposterous to let a friend scrabble for coins to contribute to the bill. Somehow we keep the score and take turns in treating each other with coffee. No one knows if the score is correct or not, but that’s of little importance. We believe coffee always finds its way into divine balance. #12 The world could be falling apart but as long as there is coffee, a Croat will survive. We measure our quality of life with coffee. If times are hard and the money is short, we’ll express it in the coffee currency: Nemam ni za kavu [I don’t even have money for coffee]. #13 For a Croat, a sign of good life is to have easy access to coffee. If you think of coffee drinking as a ritual that makes things happen between people, imagine how traumatic coffee scarcity can be. It happened in the last decade of socialism, when I was a preschool child. People queued for limited rations of coffee. This ‘degradation’ of the quality of life lives on as a collective memory. I myself can’t conjure up images of coffee lines, but I know very well that life without coffee isn’t a decent one. #14 Croats found imaginative ways to fight coffee scarcity. The collective memory has it that people travelled to Italy and Austria and smuggled back countless kilos of the venerated coffee bean. Lorry drivers en route from Austria to Greece had drop off points where they sold Minas brand to the deprived coffee drinkers. Thank goodness those days are gone! #15 Today we use the price of coffee to gauge how good the times are. As the sine qua non of a respectable life, an expensive coffee causes outrage. We will say kava je tamo 25 kuna!!! 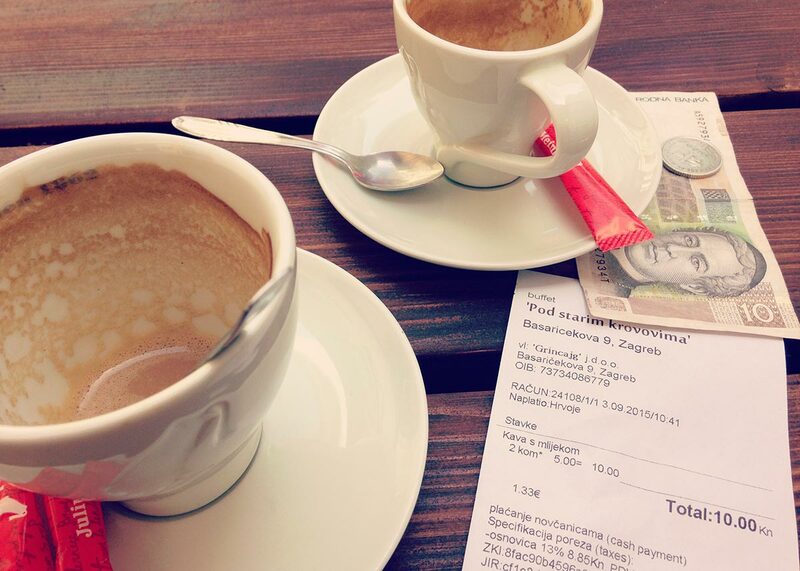 [they charge 25 Kuna for coffee there!!!] 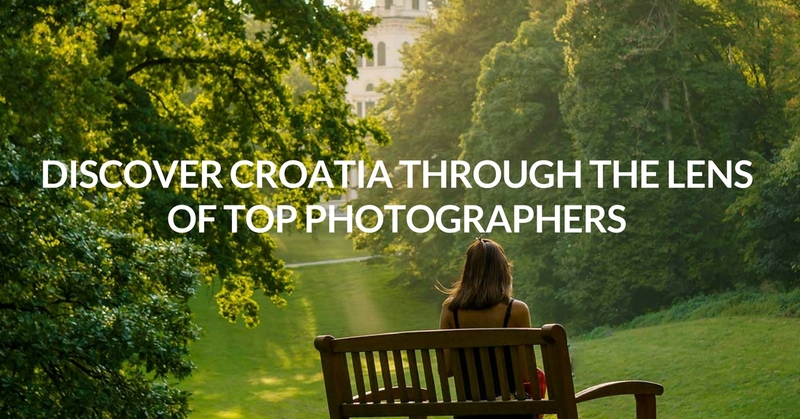 And when we say there, we mean trendy destinations like Dubrovnik or Hvar. 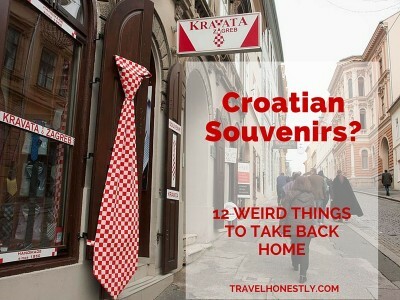 Some Croats refuse to visit places which charge a bomb for the primary requirement of happiness. #16 We’re back full circle to the familiar scene of everyone loafing around at cafe terraces. Sharing coffee with friends is the most basic particle of our sense of time. If we can’t make time for coffee, we’re seriously out of whack. It’s why we scold our friends for neglecting us with nemaš vremena ni za kavu [you don’t even have time to meet me for coffee]. #17 A healthy rhythm is the one that allows us both planned and ad hoc coffee dates. Being available to loaf around at coffees signals a good life-work balance. We’ll strive to achieve it even if work is the one that suffers. 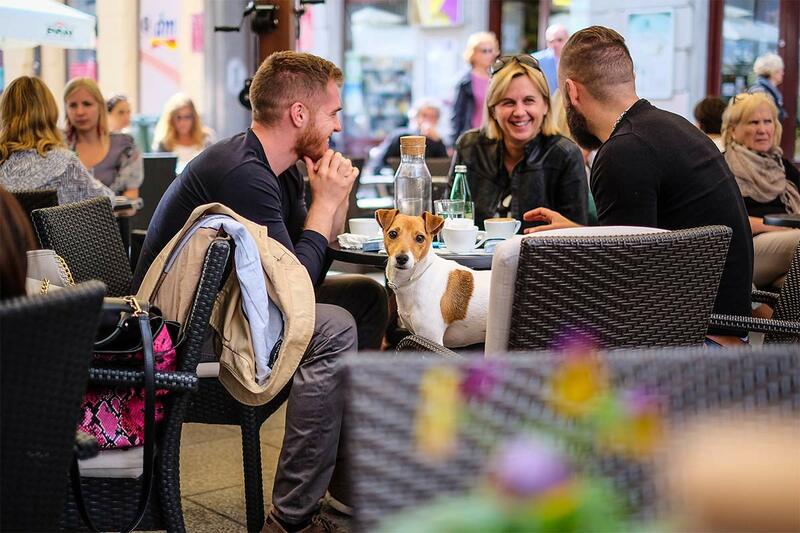 That’s the crux of the Croatian cafe culture, the reason why it’s one of our most raved about tourist attractions, and why as a visitor you feel so attracted to our lifestyle. #18 There’s a flip side to this, of course. If you try to get straight down to business with a Croat, cafe culture could become an obstacle. You expect a sense of urgency, but all we want is to finish our coffee. Try and get some sense from us in the morning and we’ll say nisam još ni kavu popila [I haven’t even had my coffee yet]. #19 Even Croats complain of Croats – stalno kafenišu [they’re doing nothing but drink coffee] – we say for the layabouts. But really, there’s no need to rush. Everything always gets done, and it’s usually via, over and because of the coffee. #20 Such a simple drink, but made in Croatia, coffee can resist or break deeply entrenched rules. And because coffee is just coffee, no one will mind. This makes it a powerful agent of social life. 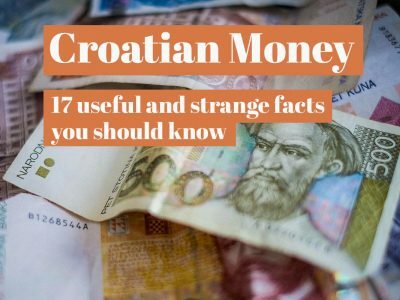 #21 If you eavesdropped on a Croat’s phone conversation – the word coffee would signal a behind-the-scenes part is coming. Serious, confidential and emotionally loaded stuff is rarely discussed in a regular phone catch-up. There’ll be a few basic pieces of information, followed by ispričat ću ti sve na kavi [I’ll tell you all over coffee]. That ‘all’ might mean many things: a heartfelt outpouring, missing juicy details or the real version of events. #22 Coffee is one of the main reasons why Croatian cafes are still smokers-friendly. 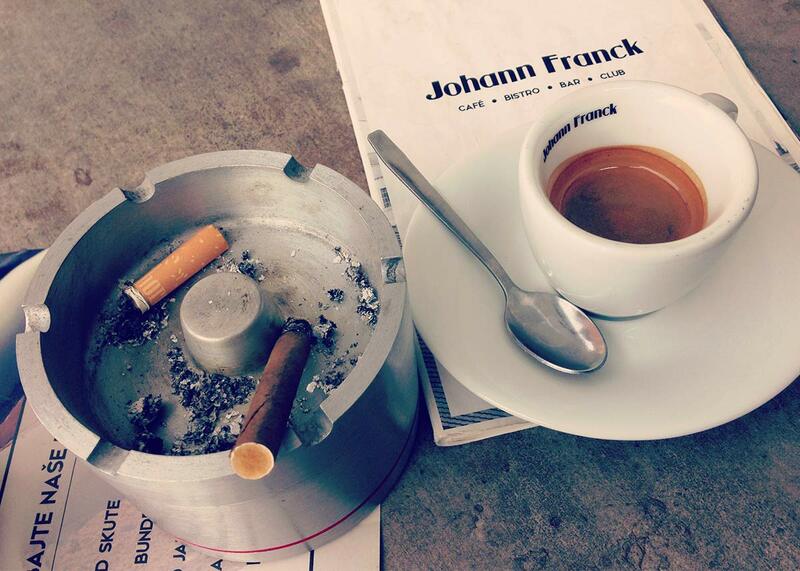 Coffee and cigarettes is the deeply ingrained match that will never get unhinged. Smokers use coffee as an excuse to never quit: kako ću piti kavu bez cigareta [how will I enjoy my coffee without cigarettes]. Even non-smokers rarely complain of a smoky cafe atmosphere, showing tolerance for everyone’s right to have coffee their own way. 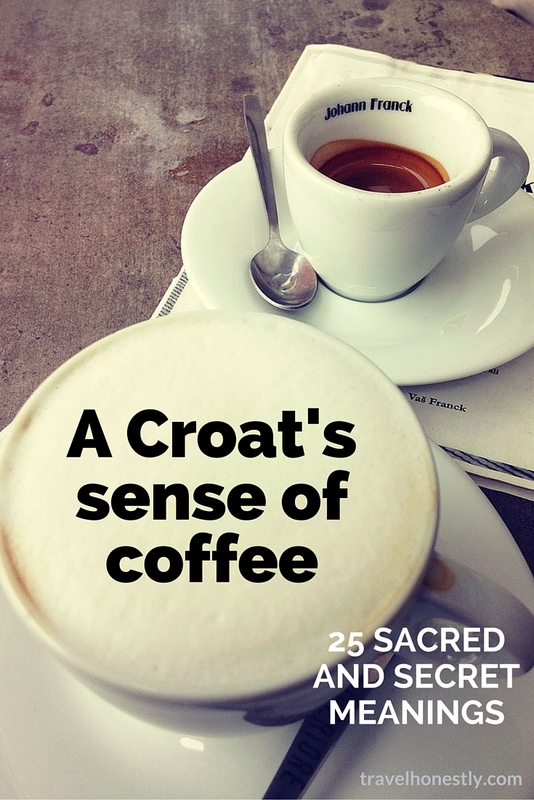 #23 In Croatia, you can use coffee to undermine the corporate money-grabbing culture. While elsewhere in the world you’ll be rushed to leave a cafe once you finish a drink, no waiter in Croatia will give you a look if you sit for hours with an empty coffee cup. Coffee always trumps profit! #24 Actually, with any other drink, you would go on a bar crawl, but with coffee, you stay true to one place. 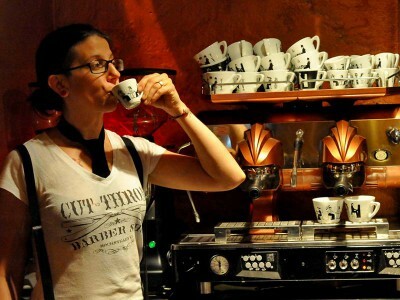 This cafe monogamy allows your waiter to really learn how you like your coffee. After a while, the arrangement exhibits familiar signs of a long marriage: with little being said, you cup of pleasure materializes before you even order it. #25 Finally, coffee is even able to shake the remaining patriarchal stereotypes. 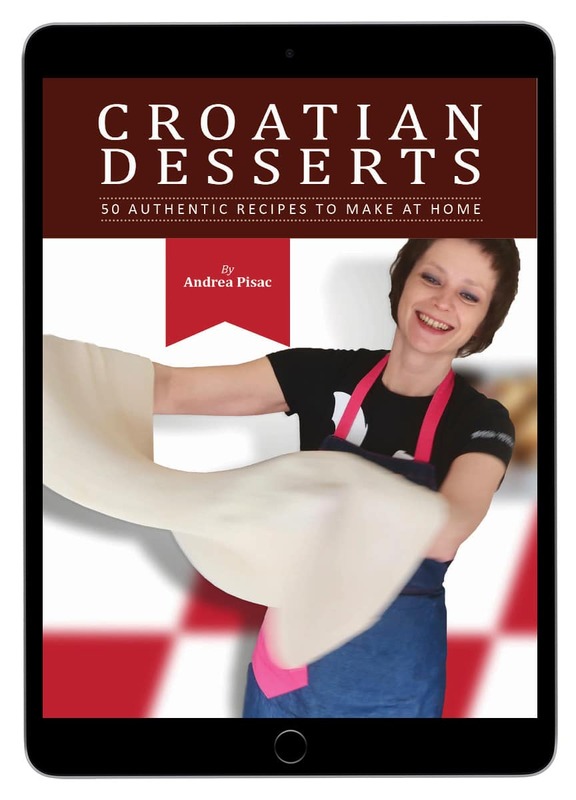 Traditional Croatian men never cook. They don’t know how to and can even brag about never setting foot in the kitchen. We often say on ti ništa ne zna skuhati, osim kave [he can’t cook anything, but he knows how to make coffee]. Coffee allows even the proudest patriarchal man to get comfortable by the stove while still keeping his manliness. The power of coffee in Croatia is limitless. It’s as beautiful and as complex as the Inuit snow. So take the first sip and learn the rest as you loaf around over a cup. 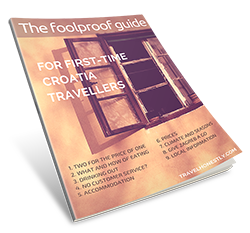 <<–– Have I lost my way migrating back to Croatia? a vrednovanje muškarca ako donese “kavicu u krevet”??? 3) Squeezing a few last minute laughs into a weekend before it is gone. Very well written text. Congrats on writing skill. Your last name serves you right! Super tekst, istinit, duhovit… a rekao bih da zbog takvog značaja kave našim ljudima gotovo je nemoguće u kafićima popiti lošu kavu… čak i u nekoj birtiji na kraju grada ili usputnoj autobuskoj stanici ili benzinskoj pumpi… svim ugostiteljima je stalo da kava bude dobra. Marko, hahaha – baš si me nasmijao svojim komentarom o kupovini kave u inozemstvu. Eto, pa čak i sad kad više ne moramo, ostalo je to negdje u nama da je dobro donijeti kavu doma i imati nepresušne zalihe. Hvala ti za komentar! Now keep in mind all said here can also be said about beer. Love the way you write Andrea. I didn’t know coffee culture ran that deep in Croatia. During our 2 months in Split we’d go to the cafe on almost a daily basis, usually having a beer or two and finishing off with a coffee. Remembering back, Croatians would often sit down with their kids and have a coffee while the kids would have an ice cream. We’ll be back in Croatia sometime this spring or summer and keep our eyes out. We’ll especially try to stay away from diarrhea coffee. Thank you, Frank! Yes, coffee is deeply rooted in Croatia. You learn that over time when almost every conversation hinges around some coffee expression. So, next time you’re in Zagreb, give me a shout! It’d be great to meet you. For sure Andrea! We’ll most probably have to pass through Zagreb on the way back to Split. Super funny post, Andrea! I’ve always found friends coming to my in-laws’ house with a brick of coffee completely weird, and funny. And I still do (regardless of how many times my wife tried to explain to me a genesis of this habit). On another note, I think I’ve changed all links to your new domain, but do let me know if you noticed any old still live. 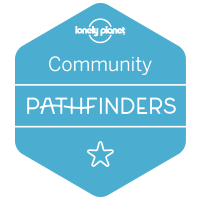 Thanks for sorting out the links! Sorry… never heard! Doesn’t sound like something a locals would say! More like a Bosnian term! I’m fifth (at least) generation in Zagreb and I say this term is unnatural here! For me coffee drinking in Croatia is the most popular “national sport” in the country.